New overnight oats recipe for you today! This time it’s Almond Butter Jelly Overnight Oats. If you love all the overnight oats recipes, then you will enjoy this as well. I love all things almond butter, so I know this almond butter jelly overnight oats will be in my rotation often! You can really go wrong with almond butter and jelly! This may be the easiest breakfast you ever make. Very kid friendly too. Make 5 at a time for grab and go breakfasts all week. I have even made up to 7 at a time with success. These are great because you can just take the jar to work with you. 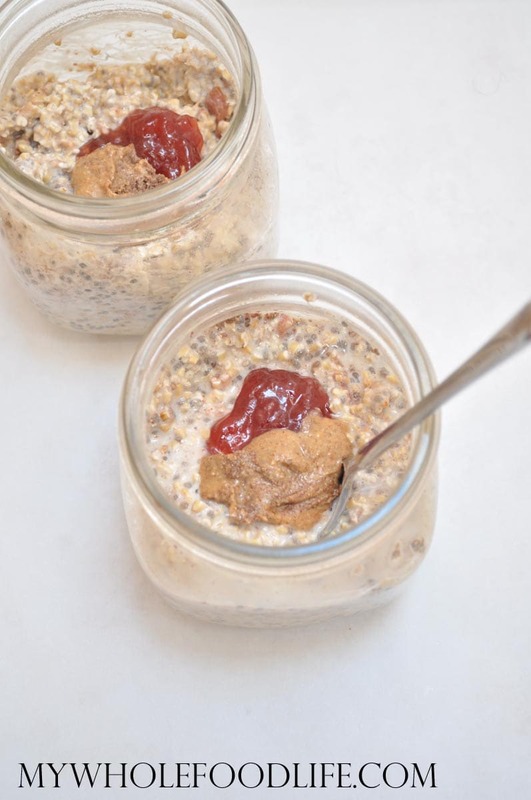 These Almond Butter Jelly Overnight Oats are vegan and gluten free. An easy and healthy breakfast. No cooking required! Put all the ingredients in a jar and mix well. I like these jars . Cover and place in the fridge overnight. In the morning, you can eat cold or warm them up. I prefer mine cold. They remind me of cereal. Enjoy! Thanks Catherine! It will be perfect with peanut butter as well. I made this one with peanut butter and blueberry jam. Yummy! Although my daughter and I agree it only needs half the cinnamon for our taste. Thank you! Thanks for sharing such wonderful ways to start the day! Easy and nutritious! These overnight oats are really good! I've made them quite a few times now and they're one of my favourites! Awesome Melanie! Glad you liked them!